"Other Items You May Be Interested In" Below, includes those Brands and Models of Embroidery Machines which are USB Port Stick Drive Compatible. The Brother 1GB USB Media Stick Flash Thumb Drive is used to save and store images or information you create. You can use the Brother 1GB USB Media Stick with Brother, BabyLock, and Janome sewing and embroidery machines that have a USB Stick port. The Brother 1GB USB Media Stick is small, durable, portable, and a reliable way to save your information. 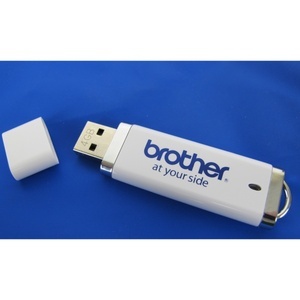 Brother logo on an environmentally friendly (RoHS Compliant) 1GB USB Memory Stick. Convenient tab for attaching to lanyard. Spins open and closed to protect usb plug-in device. The genuine Brother USB Memory Stick is used to save and store images or information you create. You can use the Brother USB Memory Stick with Brother, BabyLock, and Janome sewing and embroidery machines that have a USB port. The Brother USB Media Stick is small, durable, portable, and a reliable way to save your information. The genuine Brother USB Memory Stick has a convenient tab for attaching to lanyard.